I've got a new post up on the Technique Junkies Blog today. Would love for you to come visit me there. I've got a fun new card and all the details. 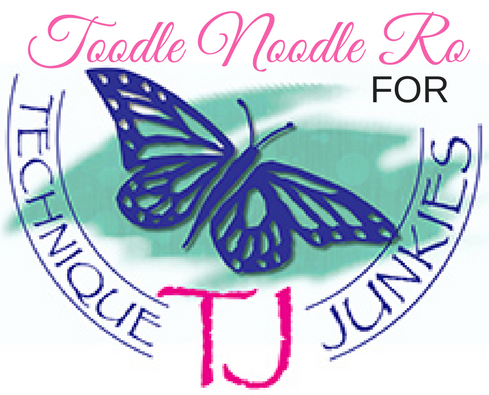 Welcome to July Hop with Technique Junkies! 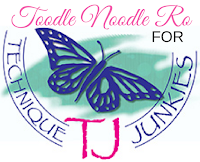 If you are here from the blog of Janelle Stollfus, you are in the right place! If not, you may want to head to the VERY BEGINNING so you don't miss any of the wonderful projects shared by the Design Team! There are some great new stamps being released this month...sixteen of them (and some are multi-stamp sets, so there are a LOT of stamps!) I played with five of those and have four fun cards to share with you today. To see the whole release, you can CLICK HERE. All New Releases are on sale until July 8th, so you'll want to get your orders in early! 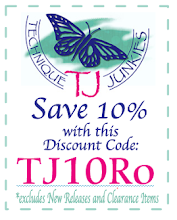 You will save 15% (no code necessary, it will be automatically applied at checkout). And for almost everything else, you can save 10% by entering the code TJ10Ro when you check out (this code never expires!). Let's start with my beach cards. First up features three of the new stamps on a Distress Oxide background. I started by creating a Distress Oxide background. On it I stamped the Seagrass stamp and colored it in with colored pencils. I then stamped the Kisses the Shoreline stamp in black ink. I added a little Wink of Stella to some of the seagrass and some Nuvo Crystal Drops to some of the bubbles. I also added some extra drops to create a little added detail, and a fish button. 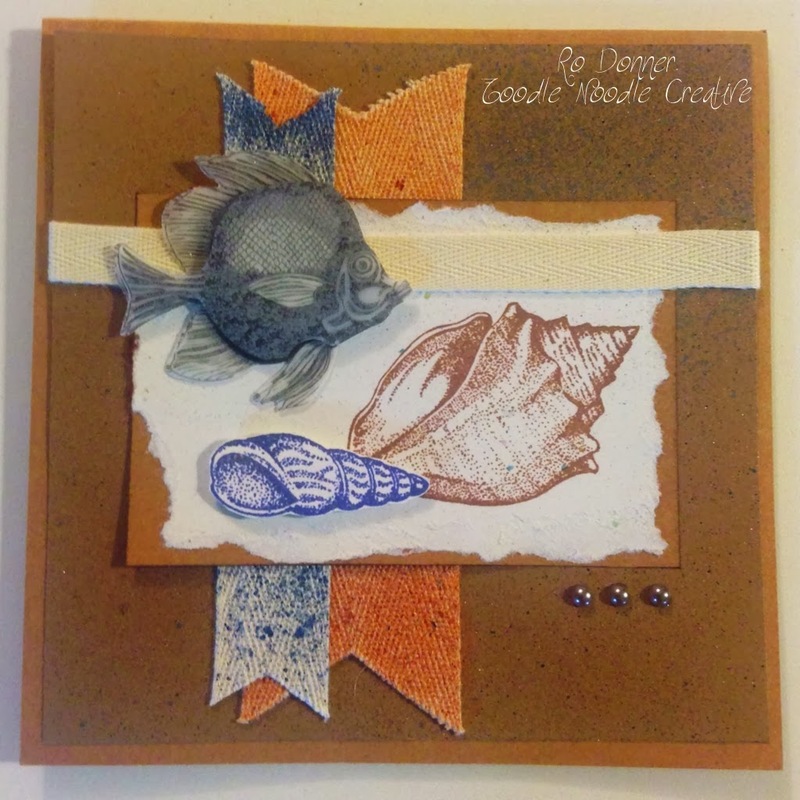 For the Seashell Border, I stamped one of the stamps from the set on kraft cardstock, colored it in, added some Wink of Stella to the shells, and trimmed it down. All pieces were attached to a kraft A2 base. The next beach card also features three sets on a Distress Oxide background. On the Distress Oxide background, I masked and stamped the two parts of the Octopus stamp. I colored the octopus with Arteza Real Brush Markers, then added some Wink of Stella for shimmer. I masked and stamped the bubbles from Seagrass in various places, and one of the Seashell Border stamps using a light green ink. I stamped the other Seashell Border stamp on kraft cardstock, colored it in with colored pencils and trimmed the piece down. All pieces were then mounted to a white A5 card base. 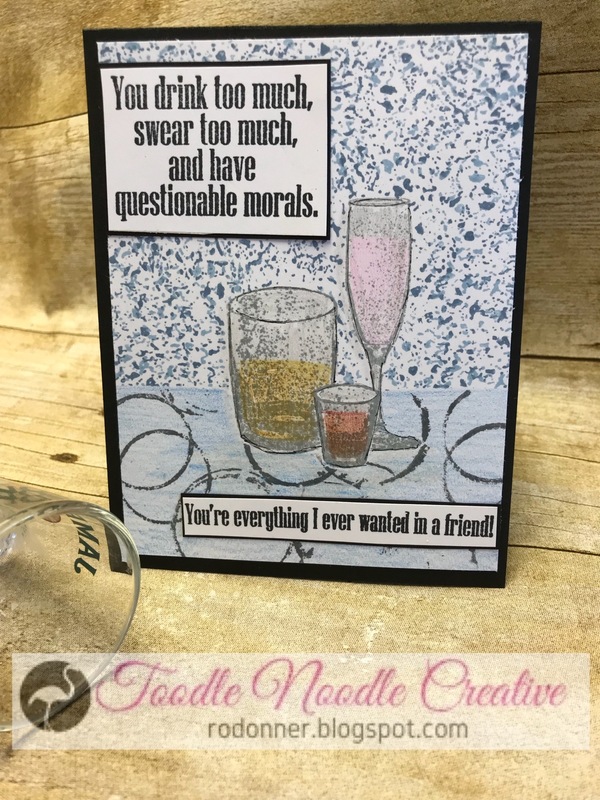 The next cards feature sentiments from the Inside Out Patience set. This set is so fun and snarky and there are 10 stamps to create both outsides AND insides of cards. I will be featuring more of these in later posts, so stay tuned. I stamped the bricks on a burgundy cardstock and colored in areas with colored pencils. 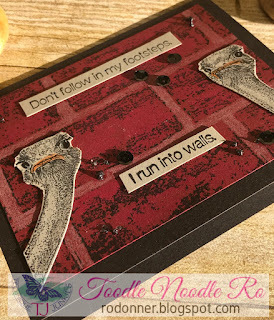 The ostriches from Your Kind of Crazy were stamped on gray cardstock, colored, cut out, and mounted on the brick panel. 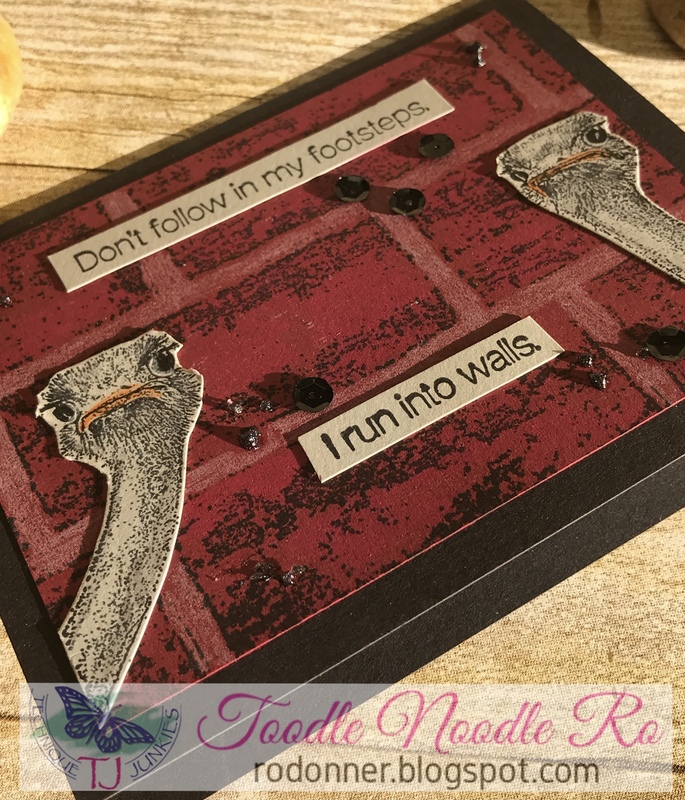 The sentiment from Inside Out was stamped on gray cardstock, trimmed down, and mounted on the brick panel, which was then attached to a black A2 card base. Sequins and Stickles were added for a little bling. Next up is a fun card for you Journey fans! To start, I stamped and embossed Linen Dots on burgundy cardstock. I colored in most of the dots using colored pencils, trimmed it down, then cut it into four panels. On each panel, I added a piece of black ribbon at varying heights. Those panels were then attached to a black A2 card base, and I added some pink embellishments for dimension and interest. I stamped the sentiment on a piece of a lighter burgundy cardstock, trimmed it down with decorative scissors, and mounted it on black cardstock. Using foam tape, I attached it to the front of the card. 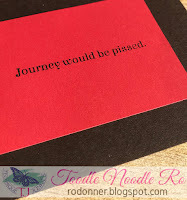 The inside sentiment was stamped on burgundy cardstock, trimmed down, and attached to the inside of the card. As I mentioned, there are three other sets of sentiments in this set. You might just see those in my next post! This is the second release of stamp sets that feature sentiments for both the outside AND inside of your card. Or you can use them both on the front, as I did in my first card using this set. Well, that's it for me today. Hope you had fun. Your next stop on the hop will be the very talented Judy Jackson!